For a related post in this issue, see Counting Monarchs in Kansas City, by Christina Pacosz. Beautiful–and look at the axes here. The long leaf bisects the frame horizontally and the monarch’s wing, vertically, while the segmented wing parallels the hanging multi-blossoms. Every quadrant, every third is rich. This is masterful composition (again.) I am in awe. That’s it! A Monarch feeding on common milkweed and laying her eggs there, too, so that the cycle begins again. Most of the Monarchs born along the way in a season have never been to their spot in the mountains of Mexico where they will head to overwinter. 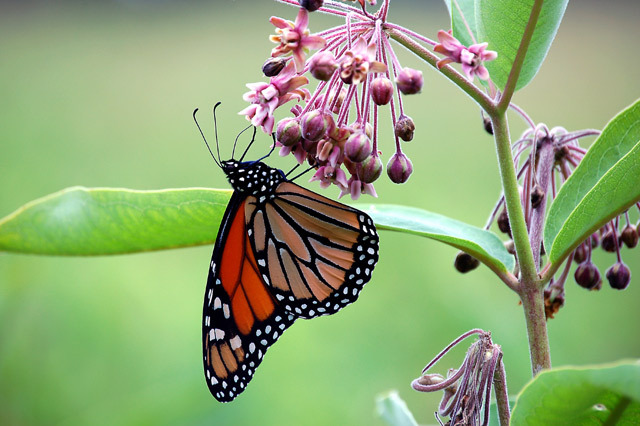 Milkweed is key to their survival. What a lovely photo, Anne! Thank you.